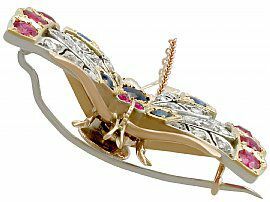 This impressive antique pearl, sapphire, ruby and diamond brooch has been crafted in 9ct yellow gold with gold and silver settings. 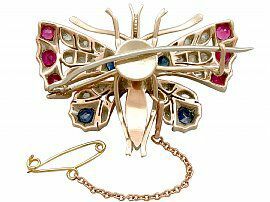 The brooch has been modelled in the form of a butterfly. 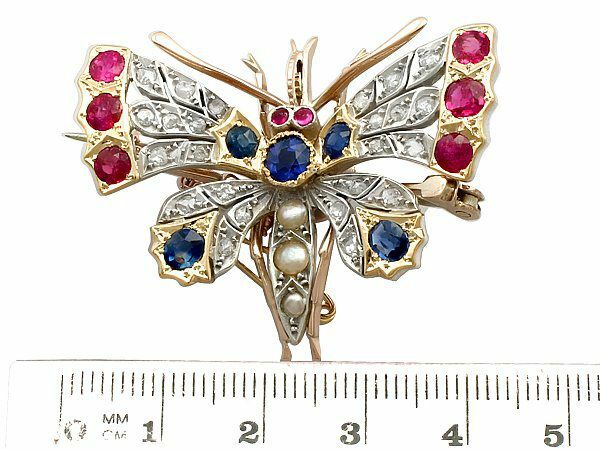 The pierced decorated forewings are embellished with three old round cut natural rubies, yellow gold set to the outer margins. 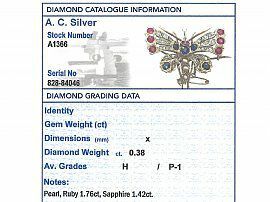 The shaped basals of the forewings, and shaped sub margins of the hindwings are also gold set, ornamented with individually set oval and round cut natural blue sapphires. 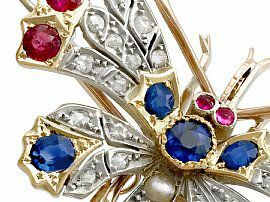 The wings have a pierced decorated form embellished with a total of twenty-four, silver set Dutch cut diamonds of various sizes. The butterfly's thorax is accented with a collet set, old round cut natural blue sapphire. 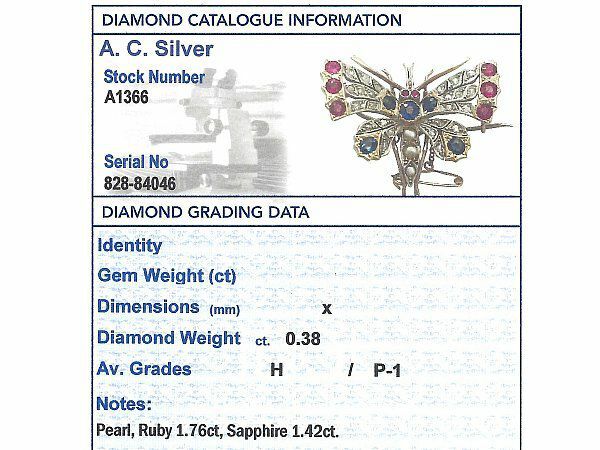 Two fine and impressive old round cut natural rubies represent the eyes. 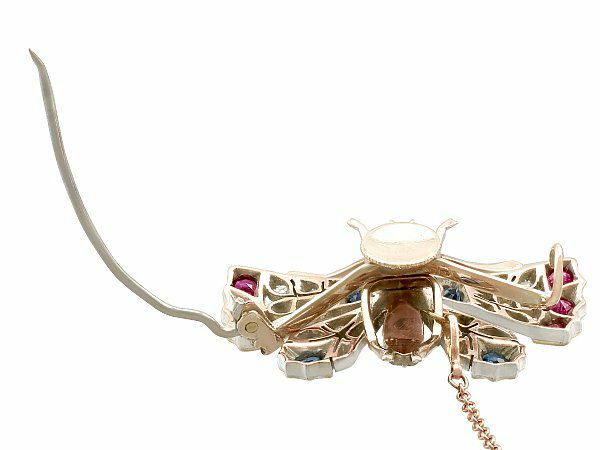 The abdomen displays three impressive natural pearls, graduating in size. 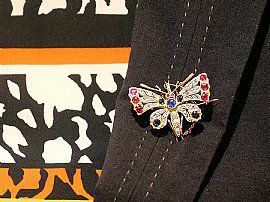 The brooch secures to the reverse with a hinged pin and C clasp. This antique pearl, sapphire, ruby and diamond brooch benefits from the additional security of a detachable fine link safety chain and clip. 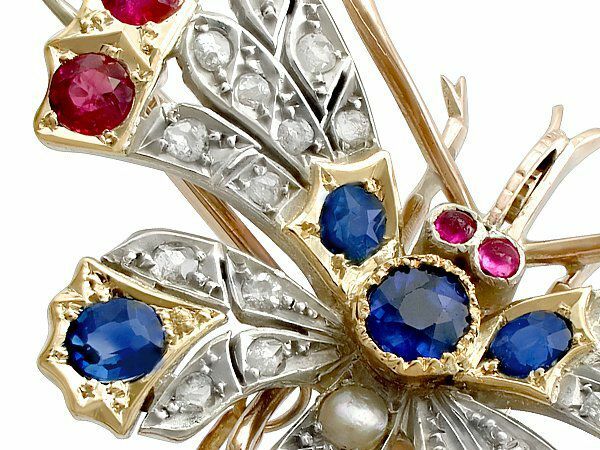 This stunning 1900s brooch is supplied with two independent diamond grading report cards. 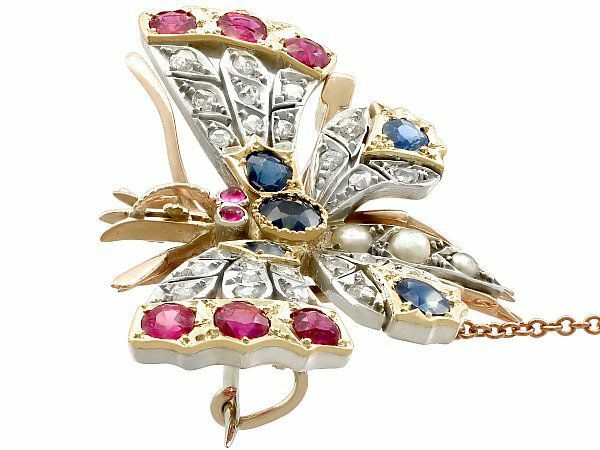 This impressive gold butterfly brooch is fine quality, set with high colour graded, old dutch cut diamonds and impressive natural rubies and sapphires. The brooch is a fine quality and a very good gauge of gold and in excellent condition. Reflections in photographs may detract from the true representation of this impressive antique butterfly brooch. Length from tip antennae to hind leg 5.5cm/2.16"